Silver gelatin print on paper. Phil Collins was born in 1970 and studied first in Manchester, then at the University of Ulster’s School of Art, Belfast. He lives and works in Berlin. Collins works primarily as a video artist, constructing performance-based pseudo-documentaries that combine mass-media’s typically exploitative standpoint with penetrative investigations into the nuances of social relations. He parodies mass-media’s profiteering language by filming the emotional reactions of his subjects within a scripted and manufactured scenario. Often recording the very processes of filming – the camera crew, the microphones, the stage set – Collins addresses the camera as ‘an instrument of both truth and deception.’ This particularly self-referential mode of production tests our understanding of the media’s artifice and entertains us with its flippancy. Like Michael Asher’s institutional critiques, in which he relocates a part of the museum’s fabric to re-engage the viewer with its meaning, Collins lifts whole concepts from strange or imported social systems through the medium of report-style documentary and low-budget television, and places them in the path of the seemingly wise and cosmopolitan viewer. When exhibiting a video work at the Tate gallery as a Turner Prize nominee in 2006, Collins set up an office that dealt with the audience’s general enquiries and the comings and goings of the gallery environment. Instead of being a disengaged, autonomous and finished production that we are only retrospectively invited to view, his work became a real-time project concerned with the social complexities of an audience that became simultaneously spectator and participant. jalan braga records a poster made by the artist for the production of his recent show The World Won’t Listen (2009). The posters were plastered around the city of Bandung, Indonesia, to enlist members of the public as participants in a Smiths’ karaoke. 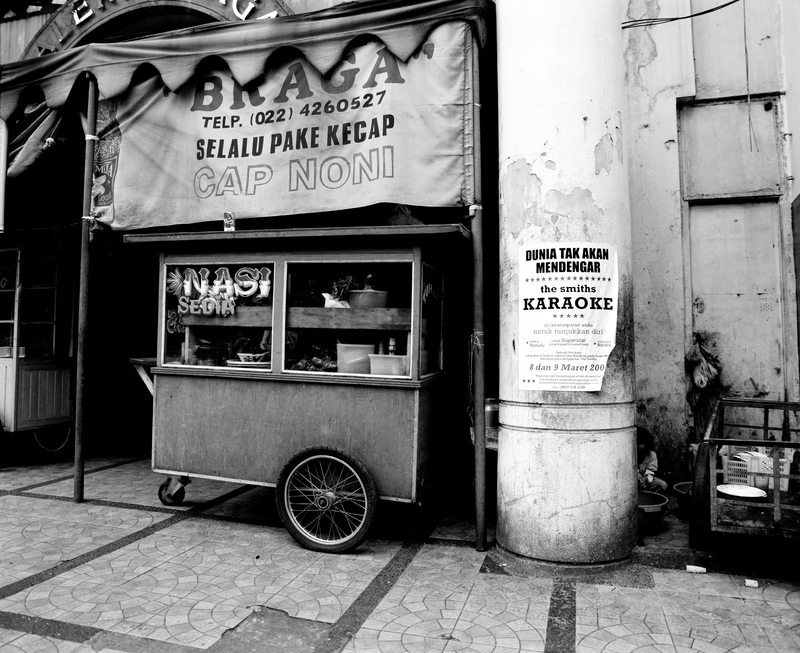 This process led to a set of recorded performances forming the central subject of the exhibition.jalan braga shows one such poster pasted on the front of a concrete column on Bandung’s central street. Detailing some of the more banal preparations for the video piece, jalan braga stands as part of Collins’ rigorous process of cataloguing and simultaneously hints at some of the integral meanings of his wider oeuvre; namely the cross-over point between truthful reporting and the designed, manipulated and filmed social scenario.